For nearly a decade, we have worked with Chicago Public Schools to bring the lifelong gift of music education to K-12 students throughout the city. We have donated over five thousand musical instruments to Chicago schools. Moreover, Little Kids Rock makes an important additional direct investment in a school district’s most valuable asset, namely its teachers. Building on the success and momentum of the district’s Modern Band programs, the Chicago Public Schools plan to double the size of the program by 2021. 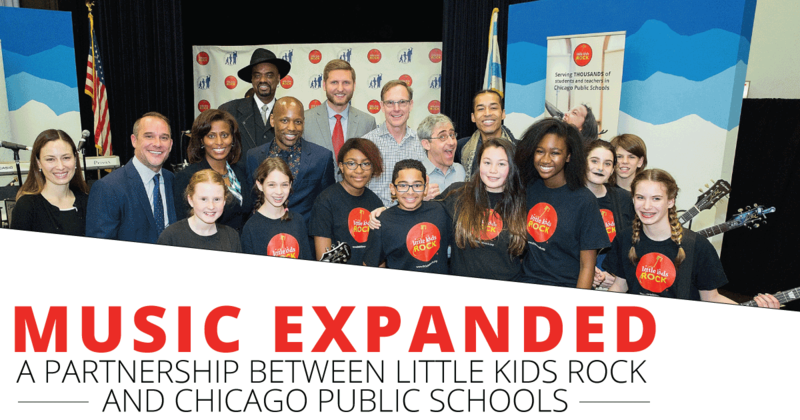 In order to facilitate this exciting expansion of music programming in the city, Little Kids Rock will donate an additional $2,000,000 worth of musical instruments, professional development, and curriculum. This will constitute one of the largest investments ever in the district by a partner organization. A full 80% of existing Chicago Public School music programs will be expanded and over 65% of all public schools in the city will benefit.